1st printing. Collects Thanos vs. Hulk (2014) #1-4 and Warlock (1972-1976 Marvel 1st Series) #12. Cosmic legend and fan-favorite creator Jim Starlin delivers an epic tale of Smash versus Space as the Emerald Avenger goes head-to-head with the Mad Titan! It's bad enough that the Hulk has been kidnapped by Pip the Troll and traded to Annihilus, lord of the Negative Zone. But things get worse when Thanos is thrown into the mix! Annihilus plots to exploit the Hulk in a most unexpected fashion, but Thanos soon launches some Machiavellian machinations of his own. As Annihilus gains vast new might, the Hulk rampages through the Negative Zone - with Annihilus' perennial rival Blastaar in hot pursuit! But when Thanos' devious scheme comes to a head, can the Hulk survive? 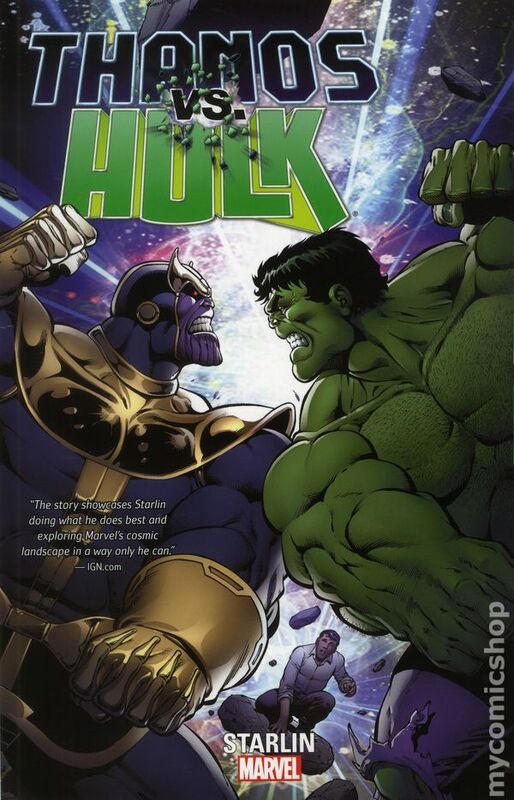 And can Thanos withstand the Hulk's pure physical power unleashed?